To achieve this end, the forces of Chaos must conquer the powerful, well-located Konor System. The Konor System embodies the glorious dream of Ultramar. Crucially, it also guards one of the few stable warp transit routes to the Macragge System. If the Chaos advance is not halted, Konor will soon fall, and a path to the heartland of Ultramar will be laid bare. 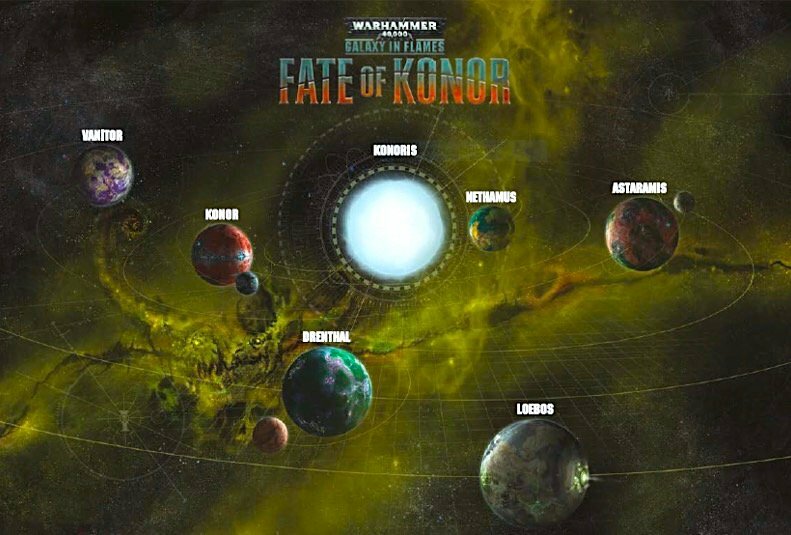 WHAT IS THE FATE OF KONOR CAMPAIGN? 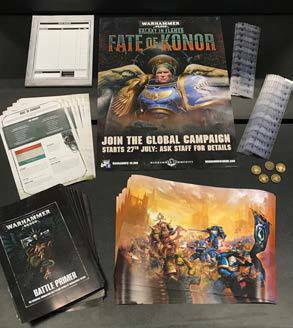 Through July, August and September all of our customers will fight to decide the fate of the Konor System to see if it falls into the hands of Chaos. All armies can get involved and the final results will be written into Warhammer 40,000 lore! Customers will fight for six planets over six weeks. Each planet will have a specific story, mission, weekly special rules and gaming theme, and will be affected by the results of the previous planet(s). Customers will be able to post results by logging ‘games won’ or newly painted datasheets in your store. Promotion – between 17th June and the 1st July. From the launch of all of our new Warhammer 40,000 products we will be promoting the fact that we are running a Global Online Campaign from the 27th July. Promotion: Talk to all of your customers about the upcoming campaign both in your store and on your store Facebook page – get them excited. Muster: This is the time for customers to choose which faction they will fight with and to build and paint their forces ready for the battles ahead. Additionally each week of the campaign will have a ‘theme’ with a selection of products that will count for double points during the campaign (see below) and the muster gives them an opportunity to buy, build and paint these units in advance! Campaign: Customers can post results in your store by playing and winning games or by painting a new datasheet’s worth of troops. They can post a win for Chaos, a win for the Imperium or in the case of all other forces remove a win from either the Imperium or Chaos! On each of the six planets some units feature more prominently than others. Astaramis Mission/Stratagem envelope: Astaramis is the first planet to be fought over in the campaign and has a Unique Mission and weekly special rules – open this envelope on the 27th July and use it for your gaming activities in week one. Please note: each week’s new Missions and weekly special rules will be emailed to you and will also be available on the campaign website. photocopy them if you need more! Window Poster: Put this up in your store window to show customers that you are running Fate of Konor activities. Campaign Map and Map Stickers: This massive campaign map will show off all the planets in the Konor System and will look great in your store. Use the campaign map stickers to show which force controls each planet at the end of each week of the campaign. ~OK, then it looks like it’s 40K’s turn for a big Global Campaign. My Death Guard are IN!